The Great Recession devastated local labor markets and the national economy. Ten years later, Berkeley researchers are finding many of the same red flags blamed for the crisis: banks making subprime loans and trading risky securities. Congress just voted to scale back many Dodd-Frank provisions. Does another recession lie around the corner? The Great Recession that began in 2008 led to some of the highest recorded rates of unemployment and home foreclosures in the U.S. since the Great Depression. Catalyzed by the crisis in subprime mortgage-backed securities, the crisis spread to mutual funds, pensions, and the corporations that owned these securities, with widespread national and global impacts. Ten years after the onset of the crisis, the impacts on workers and economic inequality persist. In a series of policy briefs, IRLE will highlight work by Berkeley faculty on the causes and long-term effects of the Recession. In this brief, we review research from IRLE faculty affiliate and UC Berkeley sociologist Neil Fligstein on the root causes of the Great Recession. What caused the banking crisis? Fligstein and Adam Goldstein (Assistant Professor at Princeton University)1 examine the history of bank action leading up to the market collapse, paying particular attention to why banks created and purchased risky mortgage-backed securities (MBSs) and collateralized debt obligations (CDOs) in the first place, and why they ignored early warnings of market failure in 2006-07. Conventional wisdom holds that the housing industry collapsed because lenders of subprime mortgages had perverse incentives to bundle and pass off risky mortgage-backed securities to other investors in order to profit from high origination fees. The logic follows that banks did not care if they loaned to borrowers who were likely to default since the banks did not intend to hold onto the mortgage or the financial products they created for very long. Large financial conglomerates including Bear Stearns, Lehman Brothers, Merrill Lynch, and Morgan Stanley became lenders of mortgages, creators of mortgage-backed securities and collateralized debt obligations (rather than outside investors), underwriters of securities, and mortgage servicers. They all also invested these securities on their own accounts, frequently using borrowed money to do this. This means that as financial institutions entered the market to lend money to homeowners and became the servicers of those loans, they were also able to create new markets for securities (such as an MBS or CDO), and profited at every step of the process by collecting fees for each transaction. Using annual firm-level data for the top subprime mortgage-backed security issuers, the authors show that when the conventional mortgage market became saturated in 2003, the financial industry began to bundle lower quality mortgages—often subprime mortgage loans—in order to keep generating profits from fees. By 2006, more than half of the largest financial firms in the country were involved in the nonconventional MBS market. About 45 percent of the largest firms had a large market share in three or four nonconventional loan market functions (originating, underwriting, MBS issuance, and servicing). 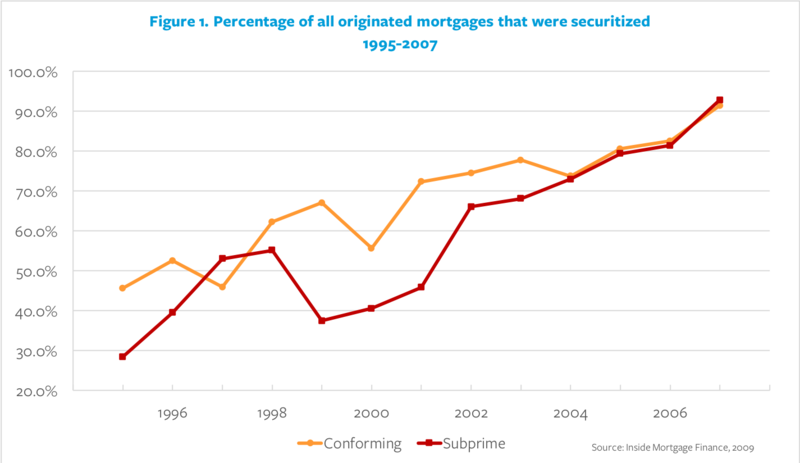 As shown in Figure 1, by 2007, nearly all originated mortgages (both conventional and subprime) were securitized. Financial institutions that produced risky securities were more likely to hold onto them as investments. For example, by the summer of 2007, UBS held onto $50 billion of high-risk MBS or CDO securities, Citigroup $43 billion, Merrill Lynch $32 billion, and Morgan Stanley $11 billion. Since these institutions were producing and investing in risky loans, they were thus extremely vulnerable when housing prices dropped and foreclosures increased in 2007. A final analysis shows that firms that were engaged in many phases of producing mortgage-backed securities were more likely to experience loss and bankruptcy. What caused predatory lending and securities fraud? The authors look at predatory lending in mortgage originating markets and securities fraud in the mortgage-backed security issuance and underwriting markets. After constructing an original dataset from the 60 largest firms in these markets, they document the regulatory settlements from alleged instances of predatory lending and mortgage-backed securities fraud from 2008 until 2014. The authors show that over half of the financial institutions analyzed were engaged in widespread securities fraud and predatory lending: 32 of the 60 firms—which include mortgage lenders, commercial and investment banks, and savings and loan associations—have settled 43 predatory lending suits and 204 securities fraud suits, totaling nearly $80 billion in penalties and reparations. Fraudulent activity began as early as 2003 when conventional mortgages became scarce. Several firms entered the mortgage marketplace and increased competition, while at the same time, the pool of viable mortgagors and refinancers began to decline rapidly. To increase the pool, the authors argue that large firms encouraged their originators to engage in predatory lending, often finding borrowers who would take on risky nonconventional loans with high interest rates that would benefit the banks. In other words, banks pursued a new market of mortgages—in the form of nonconventional loans—by finding borrowers who would take on riskier loans. This allowed financial institutions to continue increasing profits at a time when conventional mortgages were scarce. Firms with MBS issuers and underwriters were then compelled to misrepresent the quality of nonconventional mortgages, often cutting them up into different slices or “tranches” that they could then pool into securities. Moreover, because large firms like Lehman Brothers and Bear Stearns were engaged in multiple sectors of the MBS market, they had high incentives to misrepresent the quality of their mortgages and securities at every point along the lending process, from originating and issuing to underwriting the loan. Fligstein and Roehrkasse make the case that the integrated structure of financial firms into multiple sectors of the MBS industry, alongside the marketplace dynamics of increased scarcity and competition for new mortgages, led firms to engage in fraud. Why didn’t the Federal Reserve anticipate the oncoming crisis? In a 2014 IRLE working paper by Fligstein with Jonah Stuart Brundage and Michael Schultz (both doctoral candidates at UC Berkeley),5 the authors analyze 72 meeting transcripts from the Federal Reserve’s decision-making body, the Federal Open Market Committee (FOMC), from 2000 until the 2008 market crash. FOMC members set monetary policy and have partial authority to regulate the U.S. banking system. Fligstein and his colleagues find that FOMC members were prevented from seeing the oncoming crisis by their own assumptions about how the economy works using the framework of macroeconomics. Their analysis of meeting transcripts reveal that as housing prices were quickly rising, FOMC members repeatedly downplayed the seriousness of the housing bubble. Even after Lehman Brothers collapsed in September 2008, the committee showed little recognition that a serious economic downturn was underway. The authors argue that the committee relied on the framework of macroeconomics to mitigate the seriousness of the oncoming crisis, and to justify that markets were working rationally. They note that most of the committee members had PhDs in Economics, and therefore shared a set of assumptions about how the economy works and relied on common tools to monitor and regulate market anomalies. The meeting transcripts show that the FOMC tried to explain the rise and fall of housing prices in terms of fundamental issues of supply and demand, which was an inadequate frame to recognize the complexity of the changes taking place throughout the entire economy. “The fact that the group of experts whose job it is to make sense of the direction of the economy were more or less blinded by their assumptions about how that reality works, is a sobering result” (Fligstein et al., 2014, p.46). FOMC members saw the price fluctuations in the housing market as separate from what was happening in the financial market, and assumed that the overall economic impact of the housing bubble would be limited in scope, even after Lehman Brothers filed for bankruptcy. In fact, Fligstein and colleagues argue that it was FOMC members’ inability to see the connection between the house-price bubble, the subprime mortgage market, and the financial instruments used to package mortgages into securities that led the FOMC to downplay the seriousness of the oncoming crisis. These topics were often discussed separately in FOMC meetings rather than connected in a coherent narrative. This made it nearly impossible for FOMC members to anticipate how a downturn in housing prices would impact the entire national and global economy. When the mortgage industry collapsed, it shocked the U.S. and global economy. Had it not been for strong government intervention, U.S. workers and homeowners would have experienced even greater losses. Task regulators with understanding and monitoring the competitive conditions and structural changes in the financial marketplace, particularly under circumstances when firms may be pushed towards fraud in order to maintain profits. How bad was the Great Recession? This is the first of a series of policy briefs featuring IRLE faculty research on the Great Recession. The second brief will explore the effects the downturn had on family life and well-being, the third will review employment and wage trends during and since the Great Recession, and the fourth will look at strategies for regulating the recovery. Fees can be charged when loans are disbursed to a homebuyer, when the mortgage is sold to a wholesaler or issuer, and when the loan is turned into a mortgage-backed security (MBS). Fees may also be collected when underwriting the MBS deal, selling the MBS to an investor, and servicing loans part of the MBS. For more information, see: Fligstein, N. & Goldstein, A. (2014). Fligstein, N. & Goldstein, A. (2014). <Fligstein, N. & Goldstein, A. (2014). Fligstein, N. & Roehrkasse (2015).